Attacks on abortion clinics should be investigated as domestic terrorism, says NARAL Pro-Choice America. 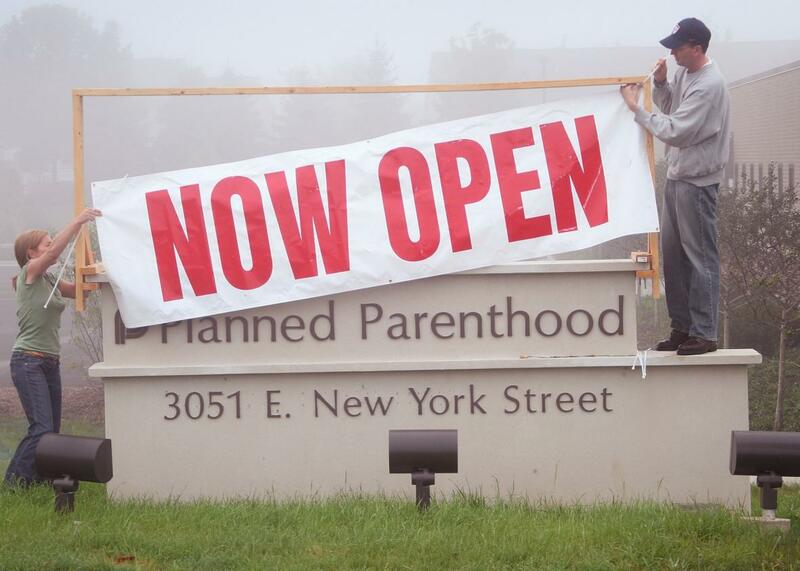 Workers outside a Planned Parenthood clinic in Aurora, Illinois. The bogus gotcha videos smearing Planned Parenthood haven’t just inspired naked posturing from conservative politicians and shows of sexism in Congress. It seems they’ve also incited a spike in violence against women’s health clinics and abortion providers, as a new Media Matters report documents. Now, women’s health advocates are demanding more coverage of the attacks from the mainstream media and a full investigation from the Department of Justice. “Where is the outrage?” NARAL Pro-Choice America President Ilyse Hogue asked in a statement on Friday. “The media need to report these incidents as what they are: domestic terrorism.” NARAL also launched a petition, calling on the DOJ to find the perpetrators, none of whom have been identified. The problem for Hogue, and for health providers at Planned Parenthood, is that American news consumers seem almost completely desensitized to violence against abortion providers—or women’s health providers more generally, since some of the Planned Parenthood sites victimized didn’t even perform the procedure. It’s easy to see why: The Feminist Majority Foundation’s 2014 report found that the percentage of women’s health clinics that received threats of violence roughly doubled since 2010. The pro–abortion rights website RH Reality Check has posited that “radical anti-choice activists have been emboldened by a wave of GOP legislative attacks on reproductive rights.” The National Abortion Federation has counted a total of 58 arsons at abortion providers since 1995. Since 1993, eight doctors and clinic staff members have been murdered for working to provide abortion, most recently, Dr. George Tiller of Wichita, Kansas, in 2009. In a moment when we seem to have grown desensitized even to mass shootings, it’s not all that surprising that the steady toll of arsons and intimidation at abortion clinics feels like news that isn’t really new. That probably explains why most of the mainstream outlets that covered the recent arsons did so with only the briefest of mentions or covered the more destructive Pullman fire without adding the context of the other attacks. The scary part is that while mainstream audiences seem inured to this issue, the conservative grassroots are anything but. Fox News and its ilk aren’t done making hay out of the false allegations against Planned Parenthood. In the absence of any convicted perpetrator, it’s impossible to say for sure whether the latest attacks were inspired by the right-wing blogosphere’s comparisons between, for example, Planned Parenthood and Auschwitz. Regardless of the root of the violence, though, the rest of America isn’t fighting fire with fire, but just watching it burn.